Toyota Hydrogen Fuel Cell Vehicle by 2015? Hydrogen fuel cell vehicles are available for lease, but not purchase, in the L.A. area. Image from Flickr. Just a few years ago, most car-industry estimates were that a hydrogen-powered vehicle would cost $1 million or more. However, Toyota motors has said that they will be able to offer a $50,000 MSRP hydrogen vehicle as early as 2015. How is Toyota slashing the price of hydrogen vehicles to 5% of the original estimate? Even if the price does drop by that much, will a hydrogen fuel cell powered vehicle make economic sense? Hydrogen fuel cell cars have been under research and development for many years. However, many major carmakers have canceled their hydrogen fuel cell vehicle programs. In general, hydrogen fuel cell electric vehicles convert hydrogen to electric power, which drives an engine. Because hydrogen fuel cells require platinum, they tend to be very expensive to produce. The Toyota Hydrogen vehicle is expected to be on the market by 2015. While this $50,000 ride would be the first hydrogen fuel cell vehicle for mass-market sale, it will not be the first HFCV on the road. 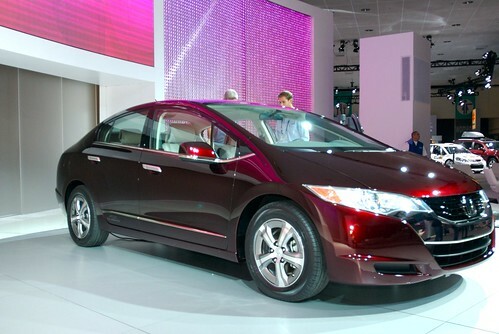 The Honda FCX Clarity can be leased (not purchased) for $600 a month in the L.A. area. Toyota claims their hydrogen fuel cell vehicle will have a range similar to gasoline engines. The 95% drop in price will come from better mass-manufacturing processes and reducing the amount of platinum needed by two-thirds. The largest challenge to hydrogen fuel cell vehicles is the lack of infrastructure. Most carmakers have decided to invest resources in electric vehicles for the simple fact that a recharging or refueling infrastructure is much more accessible. Additionally, hydrogen is, more often than not, made of fossil fuels. Fossil-fuel based hydrogen is not the only type of hydrogen available, but it is currently the least expensive source. Toyota and Honda are the only carmakers that are continuing research into mass-market HFCV’s. A hydrogen infrastructure would need to look much like a petroleum fuel infrastructure, with fueling stations around the country.